This guide explains how you can publish your own Java software components to the Maven Central Repository. The Maven Central Repository is the official public software component repository of the Maven build system. It hosts open-source software components that can be automatically consumed by different build systems, including Maven, Ant, and Gradle. Currently, Maven Central is the largest collection of Java and open-source software components of the world (see here). 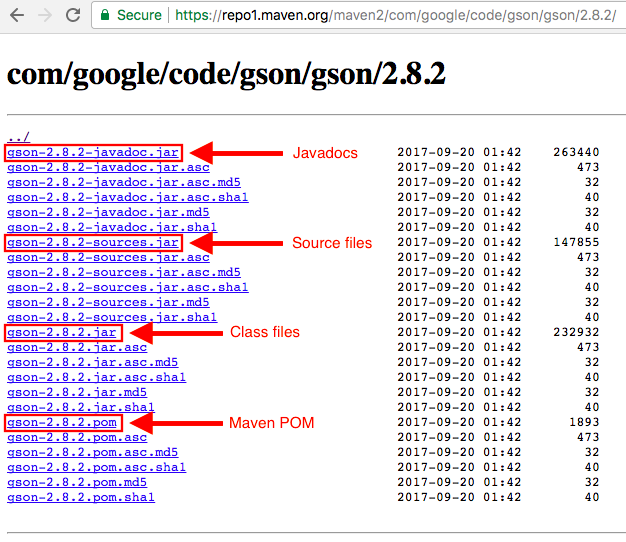 The dependency com.google.code.gson:gson:2.8.2 references to a JAR file that is hosted on the Maven Central Repository. When you build your application, Gradle downloads this JAR file so that the classes defined in this dependency are accessible to your application. Alternatively, you can directly go to https://repo1.maven.org/maven2/. Don’t worry, you will not have to generate all these files manually when you publish to Maven Central, they will be generated automatically. All the other files are signature and hash files of the four main files. The Maven POM file is there because Maven Central has been originally designed for the Maven build system, even though today it can be used with a variety of build system, including Gradle. The main file that you are interested in is gson-2.8.2.jar. This file contains all the compiled classes of the Google Gson v2.8.2 project. If you download this JAR file and add it to the classpath of your application for compilation and execution, you have successfully “incorporated” Google Gson v2.8.2 in your application, and you can use all the public Google Gson classes. So, we have seen that Google publishes its projects in subdirectories of com/google/ on the Maven Central Repository. For example, they have com/google/firebase/, com/google/guava/, or com/google/maps/. The directory com/google/ is reserved for Google, and only Google can write files to this directory and any subdirectories. In other words, com.google is Google’s namespace on Maven Central. This guide is about how you can claim your personal namespace on Maven Central to which only you can publish, and how you can publish your projects to this namespace. For example, if you claim the namespace com.mydomain, then you can publish your projects under the com/mydomain/ directory, and only you can publish to this directory. First of all, you never interact with the Maven Central Repository directly, but any interaction goes through a service called OSSRH provided by Sonatype. Sonatype is a company producing software component management solutions, and it is the “steward, maintainer and financial sponsor” of the Maven Central Repository (see here). OSSRH stands for Open-Source Software Repository Hosting, and it is a deployment of Sonatype’s Nexus Repository Manager. To publish a software component to Maven Central, you will first deploy it to OSSRH, and then release it from OSSRH to Maven Central, as explained in the next section. In general, the Sonatype documentation is the ✅ resource for questions about publishing to Maven Central. The first thing you have to do when you’re new to Maven Central is to claim your namespace on the Maven Central Repository. This has to be done by opening an issue on the Sonatype OSSRH JIRA issue tracking tool. Claiming a namespace works best if you own a domain, for example, mydomain.com, and then you claim the namespace com.mydomain. It’s also beneficial if you use an email address with this domain name for signing up to the OSSRH JIRA, e.g. me@mydomain.com. It works in any other way too, even if you claim a namespace that does not reflect a domain that you own, but the process will take longer, because it requires manual intervention. In these cases, it may take up to 2 business days until you finally get your namespace. In my case, I claimed the namespace net.weibeld, because I own the domain weibeld.net, and signed up with a @weibeld.net email address, and the JIRA issue was automatically handled within less than 10 minutes. Note that if you claim the namespace com.mydomain, you can not only use the group ID com.mydomain, but also any nested group ID like com.mydomain.this, or com.mydomain.this.that. Remember that the tedious process of applying for a namespace has to be done only once, and then you can publish as many projects as you want to this namespace. The relevant section in the OSSRH documentation is here. The most important information is actually contained in the video 02 - Applying for Access to OSSRH, and you should definitely watch it. Once you got granted your Maven Central namespace, you are ready to publish your projects to Maven Central. I explain the first step in this section, and the second step in the next section. First of all, different build tools can be used to deploy a project to OSSRH, for example Ant, Maven, or Gradle. They all result in the same final content on OSSRH, but each build tool works in its own way and must be configured accordingly. In this guide I only cover how to use Gradle to deploy to OSSRH. With Gradle, again, there are different ways to deploy a software component to OSSRH. The two most important options are to use either the maven plugin with the upload task, or the maven-publish plugin with the publish task. A great article comparing these two approaches can be found here. In this guide I’m going to to cover how to use the maven plugin with the upload task. The relevant documentation section about deploying to OSSRH with Gradle and the maven plugin is here. In essence, what we have to do now is to compose a build.gradle file with all the required information. This build.gradle file will have an uploadArchives task, and when we run this task, our project will be built, signed, and uploaded to OSSRH. That’s right, all the files need to be cryptographically signed before uploading them to OSSRH. This is done automatically by the Gradle build script that we are going to create, but it requires some preliminary setup, which is explained in this section. That means, this artifact can be included by other Gradle scripts with the identifier net.weibeld.rabbitmq:rabbitmq-manager:0.0.1. Note that <YOUR-OSSRH-USERNAME> and <YOUR-OSSRH-PASSWORD> is the username and password, respectively, that you used to sign up for the OSSRH JIRA account. Projects uploaded to OSSRH must meet certain requirements that are described here. Note that behind the scenes the uploadArchives task creates a Maven POM file, that is required for software components on Maven Central, and all this metainformation ends up in this POM file. This builds the project, generates the POM file, signs all the files with PGP, and uploads them to your account on OSSRH. When the task is finished, go to the OSSRH Nexus Repository Manager on https://oss.sonatype.org/, and log in with the username and password that you initially used for signing up for the OSSRH JIRA account (the same credentials that you saved in your ~/.gradle/gradle.properties file). If your repository meets all the OSSRH requirements, then there should be a green tick ✅ in the Summary tab, and your repository should be labelled as Open. If this is the case, then you are ready for the last step, release your repository to Maven Central. If your repository displays errors, then you need to amend your build.gradle file and upload again. The video 06 - Project Object Model (POM) explains this process. Relevant documentation is here, and especially the video 03 - Requirements and Signing Tips for OSSRH is very helpful. All the files uploaded to OSSRH must be digitally signed with the Pretty Good Privacy (PGP) encryption standard. You don’t need to sign the files yourself, this is done automatically by the Gradle build script, but you just need to set up the signing tool and keys. This provides the command-line command gpg. The private key will be used to sign the documents that we publish to Maven Central. The public key will be used by other users to verify the signature of our files on Maven Central. That is, our public key must be publicly accessible, and that’s why we have to upload it to a key server. And provide all the information asked by the prompts. The generated keys will be saved in ~/.gnupg. The identifier is an alphanumeric string listed in the pub row of the output of above command. Where <PUBLIC-KEY-ID> is the identifier of the public key to upload. We use the signing plugin in the Gradle build script, and we need to tell it somehow which keys to use for signing. Where <PUBLIC-KEY-ID> are the last 8 digits of the public key identifier displayed with gpg --list-keys, and <YOUR-PASSWORD> is the password you chose when you created the key pair. The ~/.gnupg/secring.gpg file is the private key to be used for signing. And that’s it! Now everything is set up for your Gradle build script to sign your artifact files. Releasing a repository from OSSRH to Maven Central means to make it available on https://repo1.maven.org/ and http://search.maven.org/. The relevant section in the Sonatype documentation is here. The release is typically done manually in the OSSRH Nexus Repository Manager GUI. It consists of simply closing and then releasing your OSSRH staging repository. Again, wait for the release process to finish. Your repository should now be removed from the OSSRH staging repositories. Congratulations! At this point your project is successfully published to Maven Central. You can now go to https://repo1.maven.org/ and navigate to the directory structure corresponding to your group ID, artifact ID, and version. All the files should now be there! Note that while on https://repo1.maven.org/ your project appears immediately, it may take up to some hours for your project to appear in the search on http://search.maven.org/. You can use the Gradle Nexus Staging plugin to automate the release process. 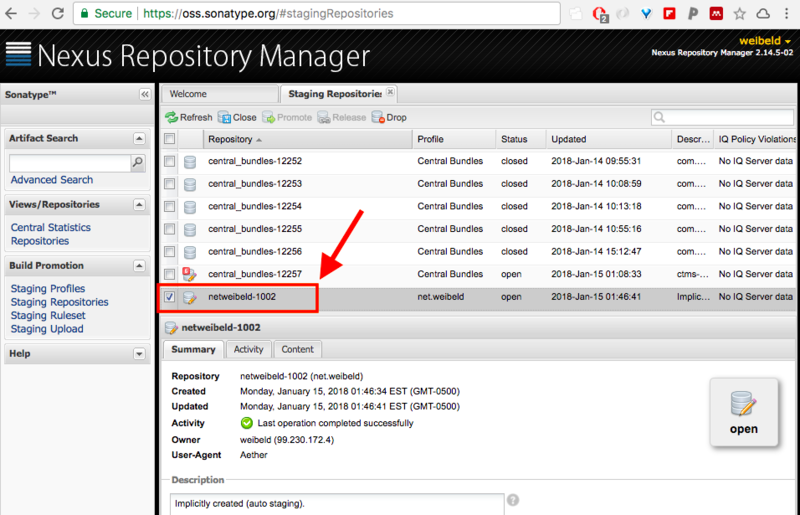 That means, you can release your project to Maven Central without logging in to the OSSRH Nexus Repository Manager GUI. However, I didn’t yet test this feature.